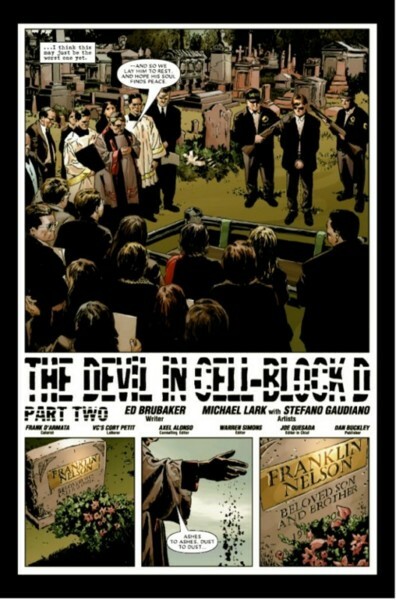 Stefano Gaudiano enjoyed a long tenure on the DAREDEVIL book with Ed Brubaker, Michael Lark and Matt Hollingsworth, and here we talk about his 3-year run as artist working alongside the creative team, as well as all the guest artists and cover artists. Many thanks to Mr. Gaudiano! Kuljit Mithra: When it was announced that Ed Brubaker and Michael Lark were taking over from Brian Michael Bendis and Alex Maleev on DAREDEVIL, were you always going to be on the book? Stefano Gaudiano: No, Michael was going to ink his own work, but he quickly saw that deadlines would not allow that so on the second issue of his run [DD#83] I started assisting him with work on backgrounds. After the first story arc I switched to full inks, then finishes from layouts for most of the second arc, and eventually back to inking Michael's full pencils for most of the rest of our run. Mithra: With issue #83, your first issue on DD, you were credited along with Lark as "Artists". There was no delineation of "Penciler" and "Inker" like most credits. Can you go over how you collaborated with Lark on art? Were you also doing layouts, pencils, and backgrounds? Gaudiano: Michael was kind enough to credit me as co-artist because that sounds better than 'assistant'. Throughout all our collaborations I've drawn a few backgrounds and very rarely figures, but always within the framework of Michael's vision. The creative relationship might be something like that between a director and cinematographer in movies. Recently Brian Level and I helped Michael meet a deadline by inking some backgrounds on LAZARUS (his creator-owned book with Greg Rucka) and we might get credited as "art minions". Mithra: Were you inking digitally? The reason I ask is that a lot of the artwork looked like it was inked with a brush but there are elements (like the backgrounds) that appear to be created with Photoshop. Gaudiano: Many of the backgrounds were created digitally, using photographs (and more recently SketchUp models). Sometimes we'd use the photos directly by adjusting the contrast, other times I would ink over them. After scanning the inks I've also re-inked digitally elements that needed to be corrected. On Daredevil it was just details; there are other assignments that I've inked more extensively in Photoshop. Mithra: Did you have to do a lot of research for the Europe issues, in terms of backgrounds etc.? Gaudiano: Michael set up and gathered most of the reference material that I used in finishing the art -- the time and effort involved might be one of the reasons why he switched to layouts on that arc. Mithra: While you were mainly working with Lark on DD, there were some issues drawn by other artists. With issue #94, you worked with Lee Weeks. Do you consciously choose a different inking style for other artists... because Lark's lines were more "brushy" (pardon my ignorance of the correct terms) and Weeks' inking was more fine lines, like in a style from the 80's when he was on the book. Gaudiano: My style does change somewhat depending on whose art I'm inking, and even working with the same artist it might change from project to project depending on what seems appropriate, what an artist might ask for, and deadline constraints. Working with Lee Weeks, for example, I've used different styles on a variety of books (Daredevil, WINTER SOLDIER, SENSATIONAL SPIDER-MAN, CAPTAIN MARVEL), partially to suit the tone of each specific story, partially depending on factors like time constraints. Mithra: On issue #100, you got to work on some Gene Colan art... not inking but colouring. How was that experience for you? I'm guessing that must have been a highlight of your career. Was the artwork just printed from his pencils with no inking? Gaudiano: Exhilarating and nerve-wracking. Gene Colan specifically asked for no inks, so I begged Warren Simons (the editor) to let me color his pages. I did sneak a bit of inking in there, and got some valuable help from Matt Hollingsworth and my friend Moritat on the color end. I was so caught up in the excitement of collaborating with Gene Colan on a Daredevil sequence that the last page didn't get delivered until about an hour before the book went to print -- probably the worst time I gave Warren out of many stressful deadlines over the years. Mithra: By issue #111, the tone of the book shifted and Clay Mann drew the issue which introduced Lady Bullseye. So in comparison to Weeks and Colan, was there anything different you tried in terms of inking his artwork? Gaudiano: I definitely went for a somewhat cleaner inking approach on Clay Mann's pencils -- we both were mindful of keeping our style in the established vein of the book at that time, but Clay's drawing is different from Michael's and I aimed for a middle ground in the inks. Mithra: You also got to ink David Aja in issue #116. The reason I keep bringing up the inking style, is because I got a Mazzucchelli vibe from this issue, with a different thicker line that reminded me of Born Again. Gaudiano: That was one of my favorite issues -- a great stand-alone story, and a wonderful opportunity to work with David, who usually inks his own art (and in fact inked the amazing splash page in that issue himself). Inking starts with an assessment of the pencils at the outset -- my own 'voice' asserts itself to varying degrees in the process, but it's always applied in reference to the pencils and the script. When possible I familiarize myself with pencilers' art outside of the immediate context. Lee Weeks and Michael Lark initially sent me samples of black & white art that they had inked themselves, which was a big help as I started working with them. In David's case I looked at his art on IRON FIST and my line approach was informed by that. I'm sure both David and I absorbed Mazzucchelli's work as part of our development, so it makes sense that his influence comes through in our DD issue however subconsciously. As an aside: when Kano replaced Michael Lark as penciler on DC Comics' GOTHAM CENTRAL I knew his art from DIAL H FOR HERO, but his style is pretty different from what I was used to, and the momentum of my inks over Michael carried through pretty heavily into Kano's first GC arc. Then I had the opportunity to visit Kano at his home in Barcelona. While our families visited I poured over a stack of Kano's original art, including projects that he had inked or even painted himself, and it was an absolute revelation that fundamentally changed my approach to inking his pencils. I loved that experience (Kano also makes great gazpacho). In the last stretch of Gotham Central it felt like my inks were closer to the creative root, and Kano's own voice come through to the surface more clearly. I'm not sure just how much of that is perceptible reading the colored, lettered and printed stories, but I felt it on every page. 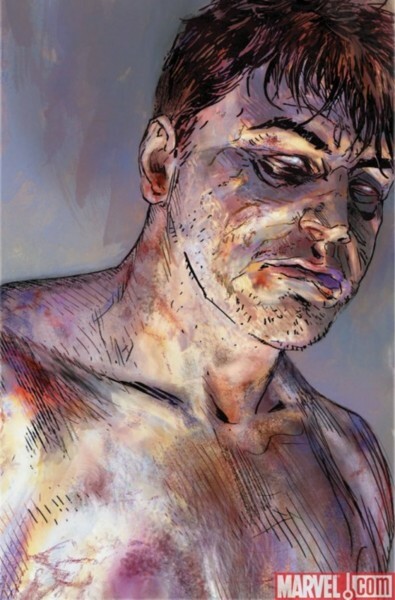 Mithra: As part of issue #500's pin-ups gallery, you drew a pic of Matt Murdock, looking very much like he's been in some boxing match. Can you describe what went into creating the pic and what type of media was used? Gaudiano: The process was fairly complicated -- after sketching some rough layouts and having one approved by Warren, I decided for some reason to create the colors by painting five different brush and ink treatments of the same drawing, scanning each take as I went along, and treating the scanned results as if they were old-fashioned color-separation plates -- then I superimposed those 'plates' as layers in a Photoshop file and made adjustments until I got something close to what I wanted in color. After that I inked the linework directly in Photoshop. The piece probably suffered from that technical meandering and overthinking. Mithra: I know that Lark would draw himself and others (like editors Warren Simons and Alejandro Arbona, and Ed Brubaker) into the comic... are you in there somewhere? Gaudiano: I definitely remember the great car-chase sequence starring our editors in issue #95. Ed had showed up in Gotham Central, but I don't recall seeing him or myself in DD. Maybe we are there and I just forgot or missed it. 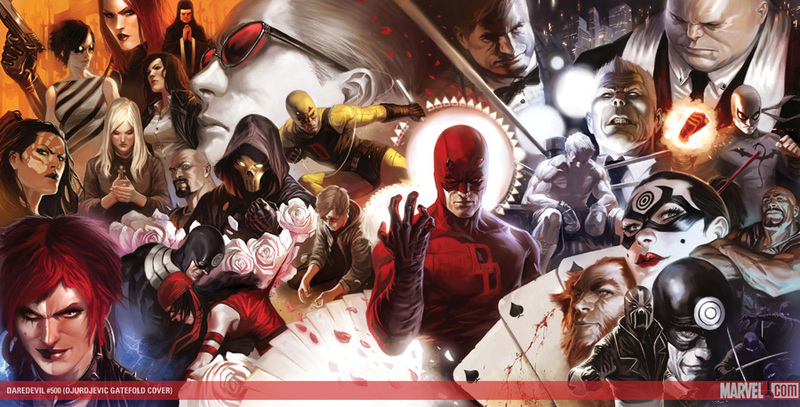 Mithra: Looking back, you worked on about 36 issues of DAREDEVIL... at the start we had Matt Murdock in jail, then a trip to Europe, a battle with Mr. Fear, and then a shift to the ninja elements and eventually Matt becoming leader of the Hand. Overall, what did you think of the stories and what all of you were able to accomplish? Favourites? Gaudiano: The experience as a whole was the highlight for me. There was open communication and camaraderie among all of the people working on that run, which got us through the recurring deadline stress. The group was tight-knit by a fundamental respect for what each person brought to the book, and efficient in spite of being scattered around the globe (from the editors in NYC to the color flatter, Jeong, in Korea -- Matt Hollingsworth moved to Zagreb during the run, and I was in Italy for part of the time). I remember as we finished the last issue having a good feeling that the quality of our collective work never flagged outside of maybe a panel here or there throughout the whole run. About the stories, a good overall sign is that Matthew Southworth, who worked alongside me on inks for some time, pointed out that I reacted visibly to Ed's scripts as I was reading them: smiling, laughing or looking shocked, I guess. Some particular details do stand out in my mind: the Punisher staging his own arrest in the first arc; issue #90, where a petty criminal manages to insult Daredevil's French while dangling over the Seine from a gargoyle at the top of Notre Dame (The art through that issue was a personal high--point as well, and the cover by Lee Bermejo is gorgeous). The character development of Mr. Fear; the smart use of The Hood, Enforcers and Wrecking Crew; the introduction of Master Izo (kudos to Ed and Michael in particular for establishing a new character with instantly credible depth and history in the span of a four-page sequence); the re-introduction of Dakota North. 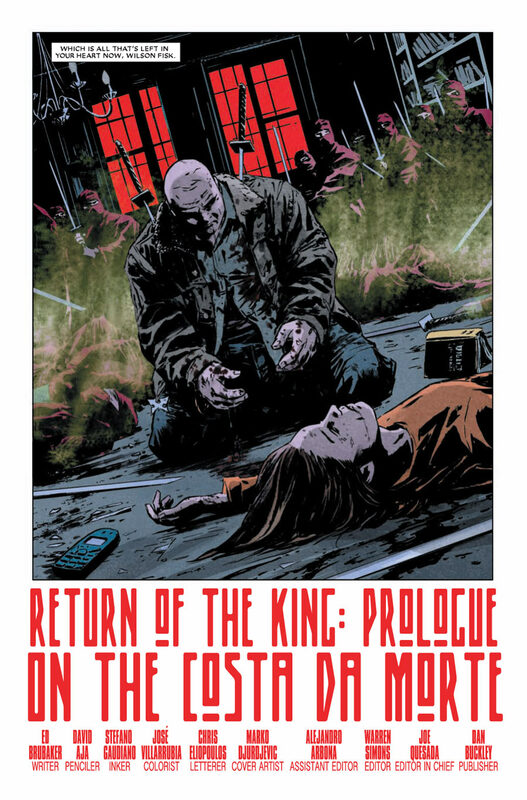 Kingpin about to be released from prison by Matt Murdock and sent into exile, on the verge of tears at the memory of Vanessa, before breaking down at her gravesite -- and his even-more-tragic return in that amazing issue drawn by David Aja. There were guest artists, assistants, guest inkers, I helped Michael when he switched to layouts, and Michael inked his own pencils many times when I fell behind schedule on my end. Matt Hollingsworth's genius and dedication held it all together. 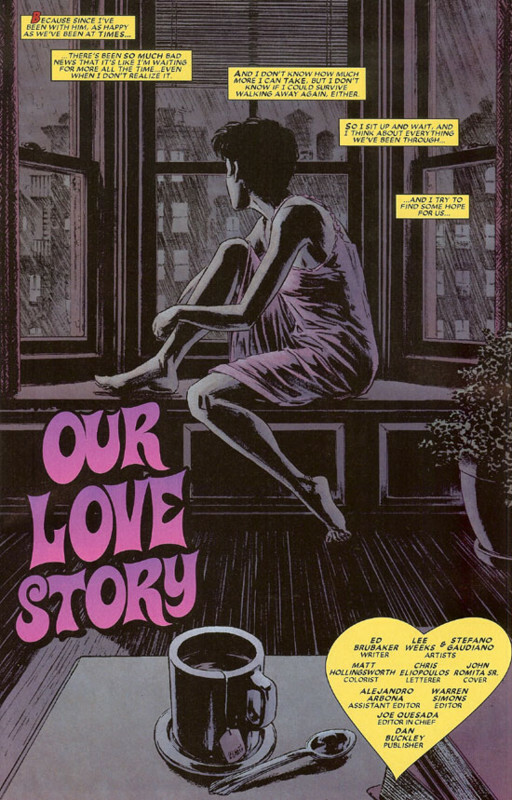 Marko Djurdjevic did some of his earliest and still-most-memorable covers for the series; Greg Rucka was along as co-writer for a sharp four-issue arc; Bill Sienkiewicz, John Romita, Gene Colan and Alex Maleev, plus Bermejo and Djurdjevic, all shared credits for issue #100; Klaus Janson and Chris Samnee showed up in our last issue, where the regular team also did some of its best work. Our editor Warren and his team managed to orchestrate a monthly book that could stand alongside those elegant European graphic novels that come out once a year. It was great being part of the whole effort. Mithra: And last question... recently I've read some PUNISHER and SECRET AVENGERS issues you've done (once again with Michael Lark)... is there any regular title on the horizon, or do you like working on different books like this after a long stint on one? Gaudiano: It's been a while since you sent me questions for this interview -- after Daredevil I bounced around at Marvel across various series, working most often with Michael (the Punisher issue we did with Greg Rucka was a highlight) and Butch Guice, who blew my mind with his smart and exciting approach to storytelling; but for various reasons I never settled on another regular title. Eventually Warren Simons invited me to work with him at Valiant Entertainment. He has a roster of great artists, and i've inked a number of titles over the last year-and-a half, most notably X-O MANOWAR and HARBINGER. I love working with Warren and the Valiant crew (which recently added DD veteran Alejandro Arbona). Their publishing line-up provides something of a best-of-both-worlds opportunity because the variety of characters and collaborators is balanced by the fact that it's a small, manageable creative universe, and even working on different titles there is the sense of being part of a cohesive whole every month. One of my favorite assignments was inking a two-page promotional pin-up drawn by Lee Garbett, featuring most of Valiant's character roster. That took me back to my early days as a fan in 1970's Italy, when all the Marvel Comics characters could still fit on a single in-house ad. Recently I was also invited to ink Charlie Adlard's pencils on THE WALKING DEAD for a twelve-issue run that's scheduled to ship bi-weekly; so I'll be doing that for some months, which should be really fun. Early on, as a reader, The Walking Dead was like potato chips -- I'd get a bunch of issues and go through them at a clip. Over time the story and characters have developed to a point where there is clearly something substantial unfolding alongside the entertainment. With the fatigue and troubles that can follow from self-employment in the arts, working on material that you can be proud of is a crucial boost. I've been lucky overall, and on Daredevil in particular it was obvious that everyone involved cared enough to make the effort worthwhile; including readers and supporters like yourself -- Thank you, Kuljit!